I've recently fallen in love with the Yum Eggplant at Sticky Rice. 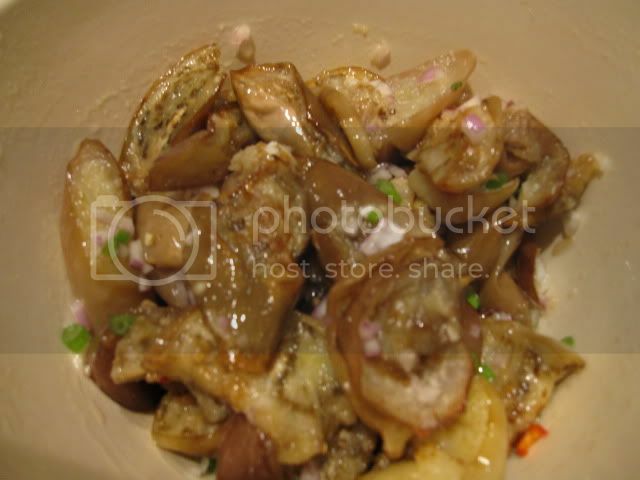 The natural smokiness of roasted eggplant pairs beautifully with lime and fish sauce. With apologies to Sticky Rice and advocates for authenticity, I tried my hand at replicating these flavors with a version of a Thai salad with eggplant and fish. 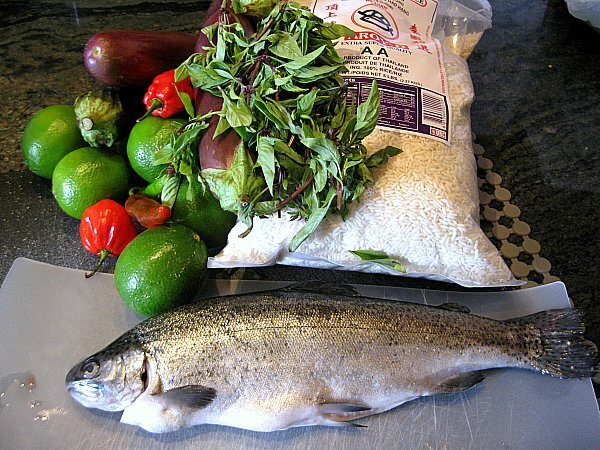 eggplant, thai basil, glutenous rice, lake trout, fish peppers, lime. fish sauce off to the side, not pictured. 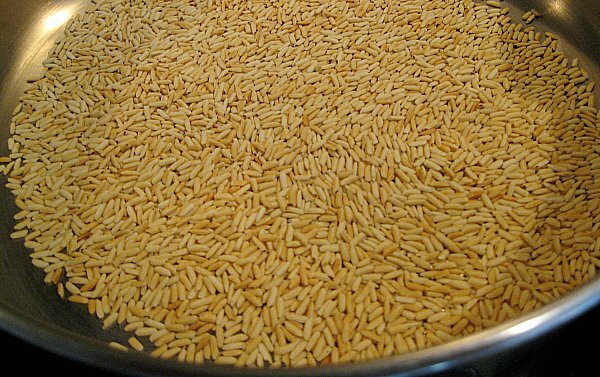 After toasting the rice to a nice golden color and enjoying the perfume that filled the room during the process, I ground the rice to a coarse powder using a mortar and pestle. 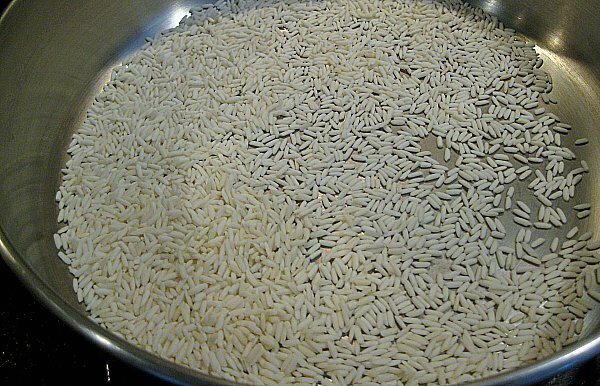 I love almost every Thai dish with roasted rice, and was glad to see how easy it was to make it fresh at home. I've had the Yum Eggplant at Sticky Rice several times, and although it's always delicious, it's been inconsistent. The main variable seems to be how smoky the eggplant tastes, and I definitely prefer it when it has a deep, bordering-on-harsh smoky flavor. 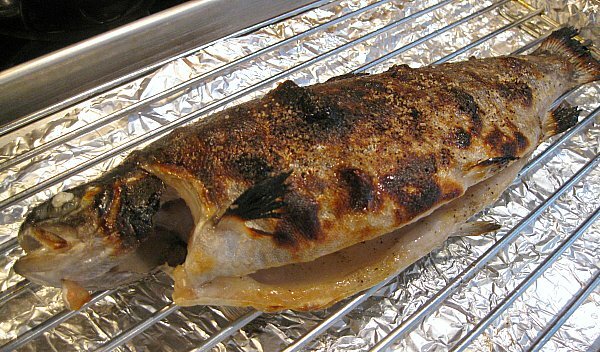 So I tried to make sure my eggplant skins were well-charred under the broiler. 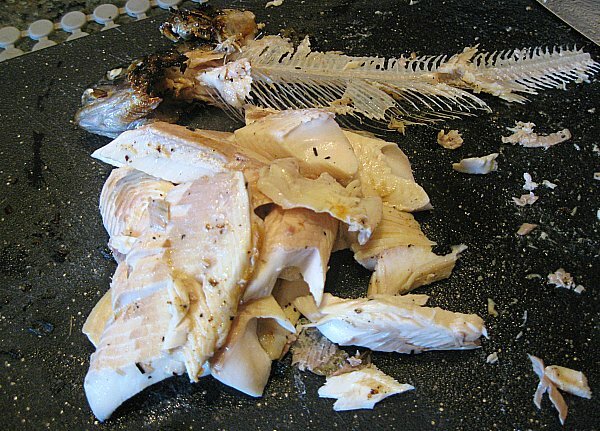 I seasoned then broiled a whole fish, then removed the skin and pulled off the meat. 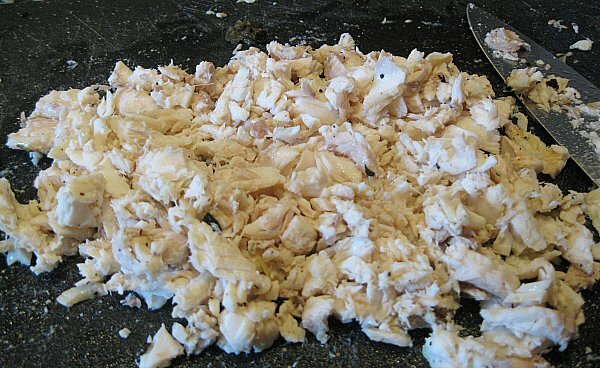 You may be wondering what happened to all of that delicious, crisped trout skin...bonus of being the cook. 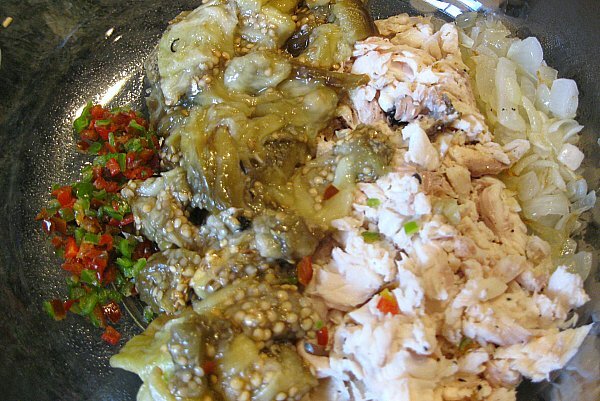 minced fish peppers,eggplant,trout and sauteed shallots. Roasted rice, thai basil, and a dressing made from lime and fish sauce about to be added. This was way more delicious than photogenic. Terrific as it was, I would definitely do a couple of things differently next time: char the eggplant even more, and use slivered raw red onions instead of sauteed shallots. A little crunch would have been nice. Kennyz wrote: This was way more delicious than photogenic. Terrific as it was, I would definitely do a couple of things differently next time: char the eggplant even more, and use slivered raw red onions instead of sauteed shallots. A little crunch would have been nice. Looks terrific, makes me want to go to Sticky Rice or, better yet, your house, for the dish. Wondering about the dressing, what were the other components? I am guessing there was sugar, curious about the rest if any. Thanks, G. Sugar would have been a very good idea, but no - I just used lime, fish sauce, black pepper and the juices that had escaped while roasting the eggplants and the trout. I tasted it and thought it was pretty good, but a little sugar definitely would have balanced it better. Thanks for the tip. The trout itself, btw, was indeed fantastic. And under 4 bucks for the whole fish at Isaacson's. I've not had the particular dish at Sticky, but sounds much like yam makeua, which when I've made it previously closely parallels your method here. Of course subbing lake trout in for, say, boiled eggs or shrimp, had never occurred to me and I think it's pretty brilliant. My recipe calls for raw shallots, scallions, cilantro, mint, pounded dried shrimp, toasty rice powder, chiles, and then a dressing which I make much like you did (lime jus/fish sauce), with a sprinkling of sugar and occasionally mirin. The rice powder is definitely worth making a big batch of, to keep for future salads (larb, nam tok, etc). Very cool, Kenny - looks delicious. Kenny, WHAT are you using for a camera? and: are you going through flickr? PS. and the eats sound great, too! What a great idea! 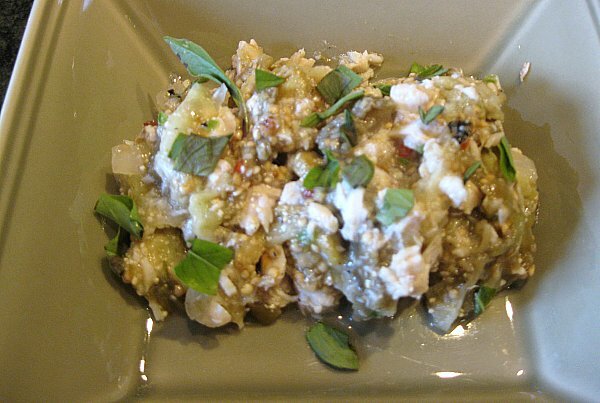 I've been making Thai Eggplant salad (Yum makeua) quite a bit lately with the yields of my patio eggplant plants. I often make toasted rice powder for neua nom tok but I never thought to add it to the eggplant (let alone add trout, also a great idea). I haven't been adding dried shrimp either. Here's a recent batch with Chinese chives (thanks C2! ), kung pao chiles (from the garden), shallots, cilantro roots, dressing (fish sauce, lime juice, sugar. I sprinkled on thai basil and cilantro as well (not shown). 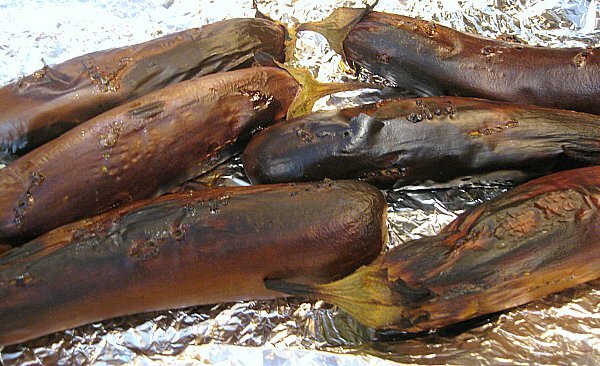 I slice the eggplant, brush the slices with oil and sprinkle with salt and roast about 25 minutes. 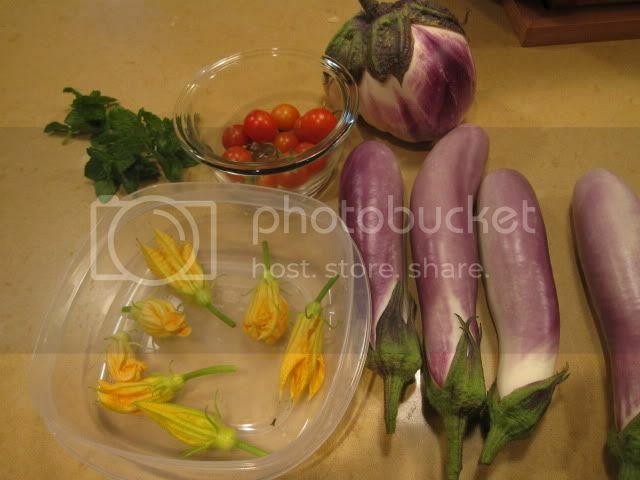 edited to add, I'm really enjoying the chubby lavender variety of eggplant from my garden (I'm not sure what kind it was--I got it at Meinke's thinking it was pingtung but it wasn't--rosa bianca maybe?). The flesh has a great creamy texture when roasted and not a lot of seeds. Geo wrote: Kenny, WHAT are you using for a camera? and: are you going through flickr? ...PS. and the eats sound great, too! tatterdemalion wrote: I've not had the particular dish at Sticky, but sounds much like yam makeua, which when I've made it previously closely parallels your method here. Of course subbing lake trout in for, say, boiled eggs or shrimp, had never occurred to me and I think it's pretty brilliant. My recipe calls for raw shallots, scallions, cilantro, mint, pounded dried shrimp, toasty rice powder, chiles, and then a dressing which I make much like you did (lime jus/fish sauce), with a sprinkling of sugar and occasionally mirin. The rice powder is definitely worth making a big batch of, to keep for future salads (larb, nam tok, etc). Sticky's "Yum Eggplant" actually has ground chicken, which I think works quite well texturally. The fish was mainly a nod to my pescatarian wife, and though it did taste good, it didn't add much texture. There's a grilled eggplant salad recipe in David Thompson's book too, but no shrimp, fish or meat of any kind in that one, and no roasted rice either. Interestingly, no sugar in Thompson's dressing, though I definitely think a bit would have improved mine.